Startups could be any new venture that the owners start with great expectations. There are many ambitious individuals who begin new ventures with great hopes but few really succeed. If you get a good job in a startup venture and if the startup grows up to be a known firm, your career will automatically become stable. However,the contrary is also true. If you start your job with a failure startup, it will leave a big blot in your resume. You need to understand these pros and cons before you plan to attend a job interview in a startup firm. First tip that applies equally to any job interview is confidence. If you wish to bag the job, make sure that you stay confident throughout the interview session. The simple recipe to be confident is to know, what you know. Most people lack confidence because they do not know exactly where they stand. This prevents them from reflecting confidence. Being confident means that you need to have an erect posture and an unwavering accent and speech. You can practice in front of the mirror so that you speak perfectly in the actual interview. Startups are newly established firms. The owners of these firms may not always be experienced. Sometimes, it could even be some amateur trying his luck in business. You need to understand whether the firm owners have sensibly started off with a planned business venture or are they just experimenting. For this, you must try and find out what your role would be in the newly established company. Try to find out how much work you will have. Also try and find out if the work is going to increase in future or remain stagnant. All these facts will help you understand whether to opt for the job or not. If it is just an experimental firm, it is quite possible that tomorrow they may have no work for you. You cannot afford to play with your career this way and so finding out these facts are essential. A well planned company or firm usually has a proper list of short and long term goals. The owners usually plan a schedule of when they wish to achieve each of these goals. The short term goals may include the clients they wish to approach and the products they wish to sell. The short term goals may also include the marketing strategies and approaches they plan to apply. The long term goals for a firm will include their growth plan and the profits they wish to acquire each year. It may also include the strategic financial planning for the firm and the money they plan to invest on the firm. A company with well planned short term and long term goals have greater chances of making profit and expanding in future. While speaking to the owners in the interview, you will be able to find out whether the owners are knowledgeable and experienced. You must question them regarding their business venture and growth plans. This will help you get a picture of how good businessmen they are. It will also help you decide whether it is worth putting your knowledge and experience at stake. Owners who are experienced will appreciate your questions and answer these questions with wise and calculated answers. If he is an amateur in the field, he may get offended and may even counter question you. If you observe such a negative attitude from the interviewers, be alert and take your decisions wisely. If you want to bag a job in a startup firm, you should be able to reveal your strengths clearly. A startup firm is already a new venture so they may want to hire experienced candidates who have knowledge in the respective field. If they feel during the job interview that you lack knowledge, experience or expertise, they may simply not hire you. 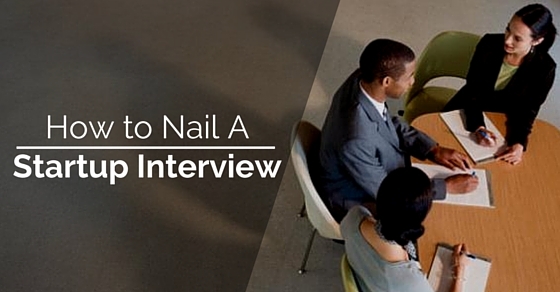 So to nail a startup interview, you should be keen on marketing your plus points effectively. Speak about your core competencies. Show how your skills have proved useful in your previous firms. Tell them what knowledge you gained from your experience in the previous firms. All these facts will reassure the interviewers that you are the perfect choice for the firm or organisation. The company will have some plans and goals when it hires you for a certain position. When you interact with the owners, you will get an idea regarding their expectations. They hire you because they want you to handle a certain position and handle certain important tasks. Tell them how well you can do justice to each of these tasks. Also reveal to them what excess knowledge or skill you possess. If they are wondering whether to hire you or not, these revelations from you will turn the decision in your favour. Choose your words wisely so that you market your skills and abilities but do not appear boastful. This is important because the recruiters do not like proud and boastful people. Such individuals fail to work well in a team and this can be a problem in future. Make sure you maintain a down to earth attitude. Presentation matters most in a job interview. A person needs to look good to create a charming first impression. You need to pick the right formal attire while heading for a job interview. Men may choose to wear trouser with a plain formal shirt. White colour shirts are the safest bet as they are equally acceptable in all kinds of job interviews. Women have many more options when it comes to dressing for a job interview. Formal skirts and trousers are equally acceptable for women. Women may also choose to wear formal suits. They may pick a couple of formal or sober accessories to go with their formal attire. Men and women should wear formal shoes to complete their formal getup. You cannot crack a job interview if you do not possess good communication skills. You must be able to speak effectively and choose your words wisely. Good communication skills come only with language proficiency. So make sure you have good knowledge of grammar and vocabulary. You must also concentrate on your body language as sometimes wrong messages can be conveyed simply through body language. If you correct the flaws in your body language, you will turn out to be an effective communicator. This is sure to improve your job prospects. Salary negotiation is an important aspect of the job interview process. Most startups would be wanting to hire you at the lowest possible salary. Many times the companies and firms even try and demotivate you and lower your value by showing that you do not possess the necessary qualifications. It is necessary that you do not get carried away by these false statements. For this, you need to fix a value for yourself or decide a salary your deserve. When the owners negotiate salary, make it a point to never go below the value you have decided yourself. This is necessary to avoid underemployment. A company with good growth prospects is an ideal place to seek a job even as a startup. However, you need to assess and find out if the job is really worthwhile. You need to see whether the particular business venture has scope of growth. You must also see how the competitors in the field are performing. Try to find out in what aspects your company is better. All these considerations will help you find out whether you have a future in the firm or organisation. It will help you make a firm and reliable decision. Many startups open each year but few actually survive and become successful. It is thus important that you consider the different risks involved in working in a startup firm before you join the firm. Salary is just one aspect but there are other aspects like growth and stability that matters to an employee. To make a wise and thoughtful decision, you need to take into account the various facts. Your confidence in professional life greatly depends on your performance in your career. So think wisely before you decide your career and future in a startup.